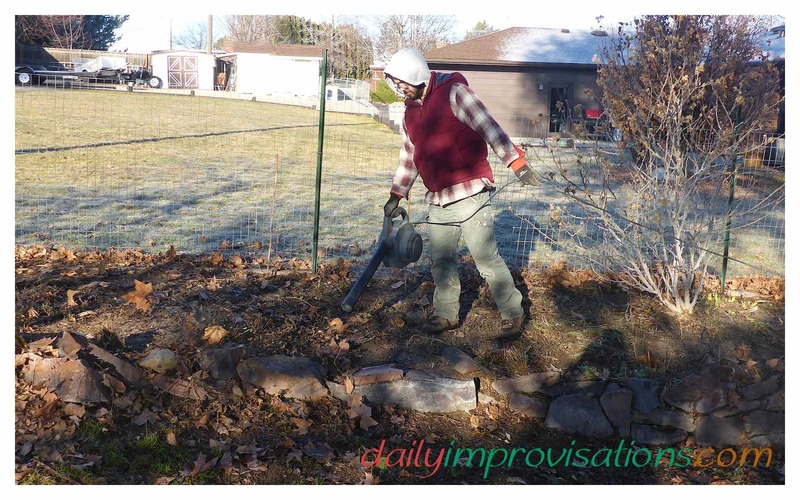 Watching professional gardeners at work can teach you useful things. My son is a professional gardener. More specifically, he graduated with a degree in Landscape Architecture and has worked in yard and garden related businesses for 12 years. He may have gotten his love of gardening from me, but I have learned some ways to be more enjoyably efficient in my gardening from him. Below, I will list 8 tips for making your clean up work faster and easier. I will discuss them some after that. 1. 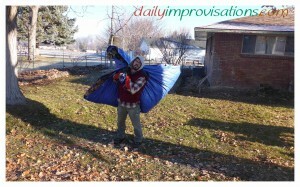 A tarp has several advantages. There is no opening to deal with, so debris can just be tossed onto it. The pile grows very quickly because no time is wasted managing the size and shape of the debris. I know from experience that a large percentage of my clean up time is spent forcing debris into bags and boxes that seem conveniently sized for me to pick up. It all has to be made to fit. Or half of what I try to toss in misses and I have to go pick it up again. Thorns scratch me as I try to compact things. Sticks tear bags. Boxes break and get wet. Neither type of container can be easily drug across the yard, so I have to carry them individually down to the curb or load them all on a wagon in awkward heaps for transport. Leaf clean up made easier with a tarp flat on the ground, onto which leaves can be raked. Unfortunately, I did not get a photo of the use of the tarp the day before with the heavy debris being taken to the trailer. 2. A lot of bags worth of debris fit into one trailer. It is probably smart to tie a tarp over the top of the load before attempting to drive to the dump, but that also allows for a bit of heaping and making extra good use of your trip. It only cost me $8 for unloading the trailer load yesterday. I say “me” as “the queen” this time. My son was working for me yesterday. I haven’t visited many dumps, so you will have to investigate your own dump’s rules and fees, but organic matter should be very popular in our day and age. Here I must admit that I have previously rarely been to even this local dump myself. In fact, I have only visited it a couple of times. However, as I compare how well this process works, I think I am going to have to put a clothes pin on my sweet little nose and do it for the sake of the garden, and a future less taken up by such clean up. 3. It is helpful to gather the debris in two stages. First, collect all the hard and coarse debris, like fibrous dead stalks. Basically, anything that will not compost well or that you don’t want to spread the seeds from should go in the first round. This is the stuff that will comprise your load for the dump. The second tier of debris is soft, compostable debris, such as leaves or soft rotting garden produce. The leaves will be addressed specifically in the next point, but if a few are left behind, that is not going to be a problem for your spring gardening. They will either compost on the spot or be a nice layer of mulch until they do, assuming they don’t blow away. Unfortunately, them blowing away is a large part of the problem. They tend to pile in places that kills desirable plants and grass, or to heights and in shrubs in ways that are both unsightly and not quickly composting. This is why I have all my leaves dumped into the chicken pens, which makes the chickens embarrassingly happy. If you don’t have chickens, you might need to think about another trip to the dump, or better yet, a simple composting system in a corner of the yard. Chickens happily composting fall leaves. 4. Using the top of the shop vac as a blower solves a lot of the trouble with leaf clean up. Garden paths or secret corners can have the leaves blown out of them into heaps that are much easier to deal with in the open lawn. 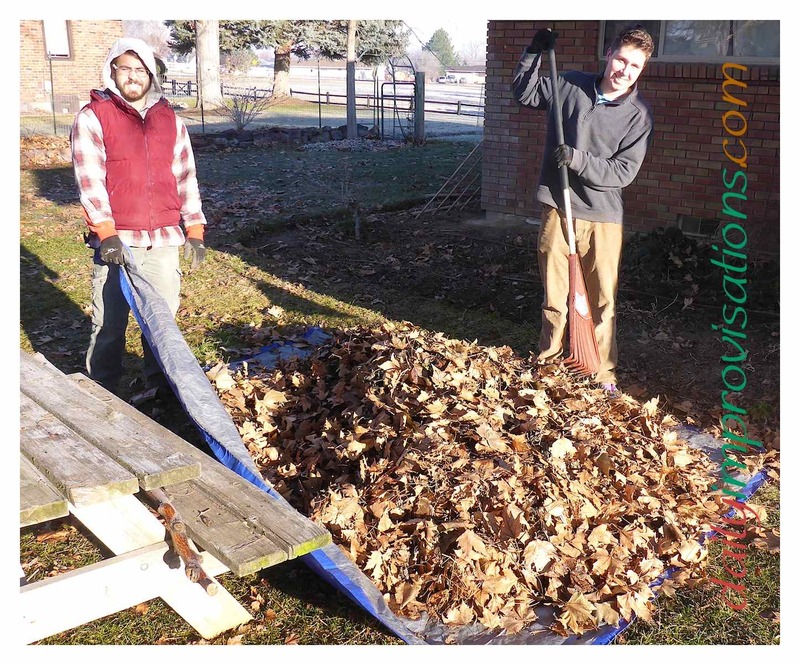 Once there, the leaves can be quickly raked onto a tarp for transport; or they can be somewhat spread and mowed, to chop them up better for compost. A heavy duty extension cord makes it possible for us to reach nearly every nook and cranny on my acre with the blower. Just beware angles along structures that may have become spider habitat or have hidden dirt under the leaves. Blowing at this wrong can be unpleasant. Although he is using the top of my shop vac as a leaf blower here, to easily clear the leaves from a flower bed, he is strong enough to prefer a back-pack style, gas blower if it is available. Those are stronger and work faster. I will probably stick to the electrically powered blower. 5. It might seem the wrong time of year to use a weed whacker, but if you are like me, there was some edging that didn’t get done in the fall. A warm winter day can be a very satisfying time to get caught up on some edging, especially when you realize it won’t grow for weeks! I suggest an electric version because I have tried both gas and battery operated ones. The gas ones are just too heavy for me to use long enough to take care of my acre. The battery powered ones seem to only last about 20 minutes per battery and get quite weak for the last 5 minutes. It takes a long time to recharge them. Plus, the battery is supposed be cool before recharging commences. Even with two batteries available, I was getting frustrated. I had fun with it for a while, as you can read if you click here. If you have a small yard, it still might work for you, but I have become convinced that the weed whackers plugged into outside outlets are the thing for me. I got one for $38 at Walmart last summer. Again, a heavy duty extension cord is a good accessory. 6. Don’t get carried away with all this clean up and prune your trees too early. You don’t want them to be raw and suffer from further cold, and there will probably be further cold. But be encouraged. Having done all the other yard clean up, pruning will be more straightforward, since you won’t have to dig out a bunch of debris to get to the trees, or find rotted out trunks or avoidable insect or rodent infestations due to debris piling up against trunks. 7. Be careful where you walk even though much of the garden is dormant or dead. You still don’t want to compact the dirt. You also don’t want to injure roots or spring blooming things that are coming to life under the soil. Disregarding this simple caution may be tempting to get things done quickly, but it will lead to disappointment and more work later as you try to repair damage or plant where the soil has been compacted. 8. Only hire people to help you who have an understanding of gardens or a desire to learn about them. Someone may have a great work ethic and a broad back, but if they don’t understand what is at stake, they will trample things, pull out perennials, and generally destroy things. They won’t mean to, they just have no concept of the difference between a dead weed and a dormant clematis. Trust me, you cannot supervise them closely enough. None of this talk of efficiency means you need to work at a certain speed or even a specific number of hours a day. Sure, there are times when blocking out some time can help you to get through to a helpful point, so that you don’t have to try so hard to remember what you were doing, or your work doesn’t get undone. If you leave the leaves in the middle of the yard for too long, you will be set back. And you might need to rent a trailer or plan for a day with enough time to get to the dump. Other than that, you can use these ideas for work “at your own speed” and still be efficient faster than you were before! If a single person is doing all the work, it might be better to use a smaller tarp, at least for heavier loads. These leaves, however, posed no challenge.